Recently, while answering the phone at work, I discovered that some of our happiest customers are veterinarians. The phone rang. I answered it. "Hello, Optimal Health Center,” I chimed. “Could you please help me place an order for some of your enema equipment?” the caller asked. “Sure!” Upon finding her customer number, I noticed she had ordered from us multiple times and that her orders always consisted of 10 to 20 infant bulb syringes, 5 to 10 two-and-a-half quart clear enema bag kits, and 5 to 10 flex tip enema nozzles junior. “Hmmm, thanks for your past orders. What can I help you to order today?” I offered. “I would like 10 infant bulb syringes, 10 two-and-a-half quart clear enema bags, and 10 small enema nozzles,” she told me. “Do you own an alternative health clinic?” I asked. “Wow, cats and dogs get enemas at veterinary clinics?” I asked in surprise. I thought I was up on the many regular uses of enemas, but I was abruptly realizing that there was a whole area of enema use that I wasn’t familiar with. 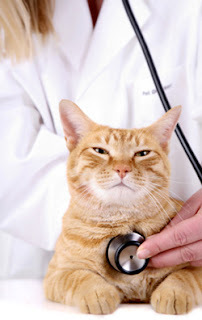 “Yes, pets become constipated for many reasons and respond well to enemas. As I said before, especially cats. We give enemas daily to pets here.” Her matter-of-fact tone on the issue of giving pets enemas and my inner awe made me laugh out loud. It turns out that a handful of veterinary clinics order enema equipment from OptimalHealthNetwork.com. We have been wondering if we could give out dog a coffee enema to help with his arthritus.. When I moved to the DC area in 1973 I left behind year-old cat Mitzie with a student intern. When I checked back a few months later he said he had taken her to a vet for constipation and was advised to give her an enema. Enroute home, he stopped at a drug store for an infant bulb. Once home, Mitzie gave one look at the bulb, jumped into the litter box and had a great BM!! Who says animals are 'dumb" LOL.